The female face of Yves Saint Laurent’s menswear line. The term “menswear” is nearly devoid of meaning these days, as women have deftly made it their own over the past century. Long gone are the days when women were expected to only wear constrictive corsets, heavy underskirts and long elegant dresses. 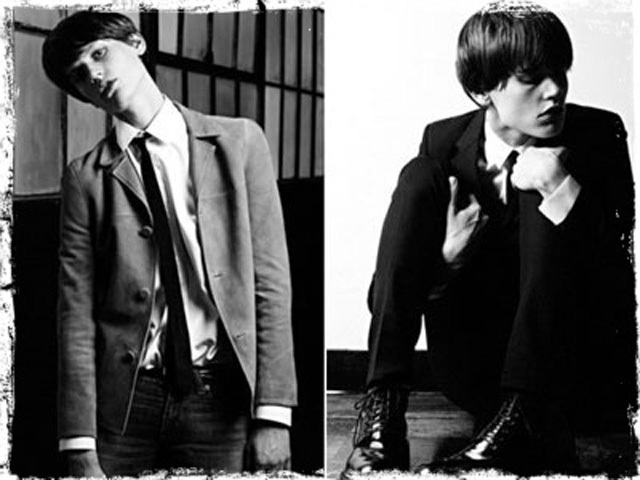 Now we wear suits, pinstripes, plaid shirts and skinny jeans without abandon. Women have even been the face of couture menswear lines. Of course, this drastic shift didn’t happen overnight, or without struggle…. 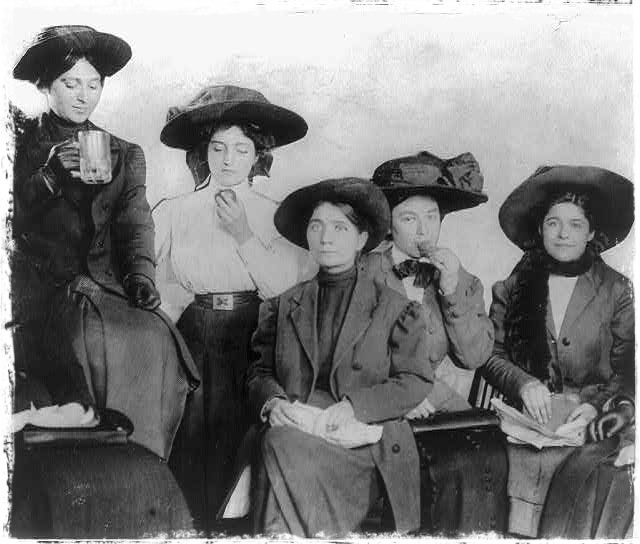 Workers having lunch in typical shirtwaist attire, circa 1910. World War I catalyzed major shifts towards women’s liberation—not the least of which included fashion. Before this time, social customs were very strict regarding women’s clothing. Ankle-length dresses, overly inhibitive underskirts and painfully tight corsets were a must. As more women entered the workforce during the war though, they demanded less restrictive, more practical attire. Although women continued to wear skirts, their clothing became decidedly more masculine, adopting tailored suit jackets and shirtwaists. 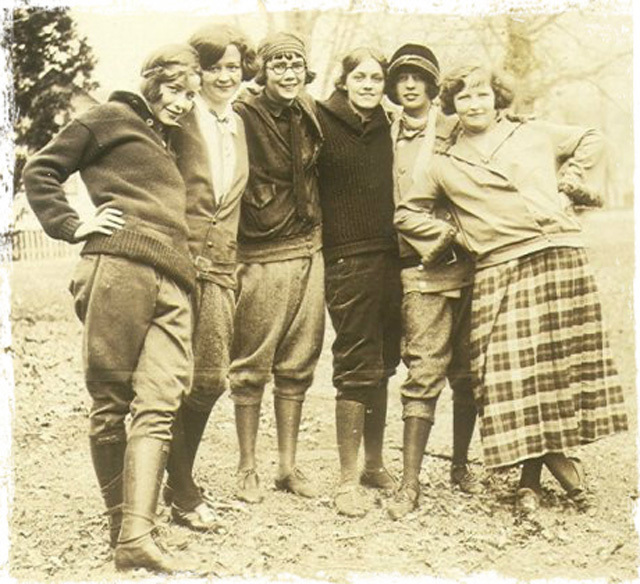 Young women donning “sportswear”, circa 1924. With post-war optimism spreading, a booming stock market and less restrictive social customs, the 1920’s set the stage for the most dramatic transformation in women’s fashion. Women were flooding the workforce and had gained the right to vote. Fashion trends followed suit (literally! ), becoming more masculine, more practical and, for the first time, sporty. Led by “flappers,” corsets were completely abandoned in favor of looser clothing that emphasized a straighter, more boyish figure (flattened bust, loose waist). 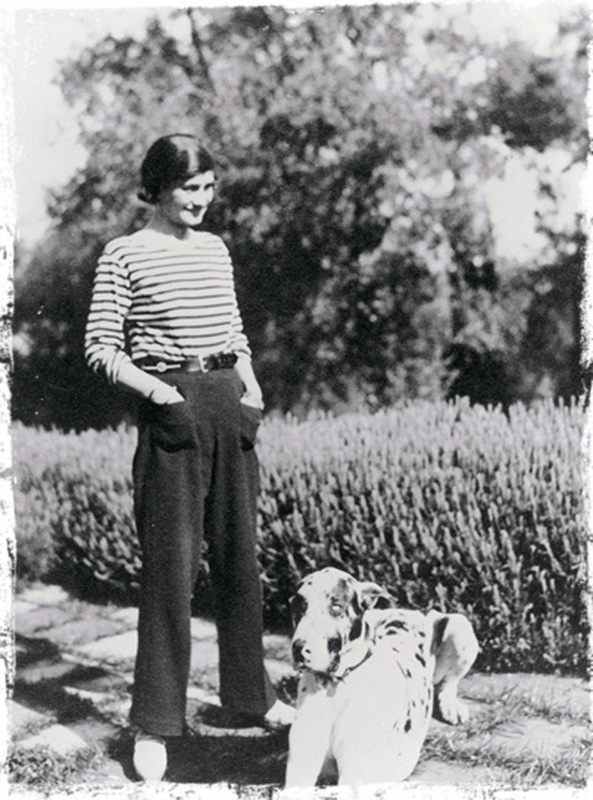 Coco Chanel’s rebellious menswear look in the 1920’s. One of the most influential fashion icons of the 20’s (and to this day!) was Coco Chanel. She rebelliously dismissed the feminine styling of her day and embraced an androgynous style which continues to influence contemporary fashion. She may be famous for her luxury fragrances and haute couture dresses now, but she was one of the first women in history to wear trousers! She paved the way for menswear-inspired clothing, dexterously designing elegant suits, tweeded blazers and simple, yet powerful everyday-wear for women. Throughout the 30’s, Hollywood continued the sky-rocketing popularity of menswear for women with such actresses as Marlene Dietrich and Katharine Hepburn. Image courtesy of “Make and Mend for Victory” booklet, at Cargo Cult Craft. 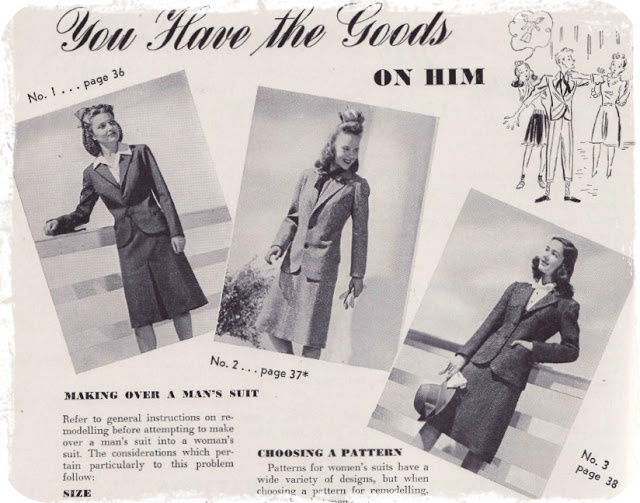 During WWII, “fashion” took a back-burner and menswear became women’s clothing out of necessity. With post-Depression-era sensibilities and strict rationing of raw materials, women were encouraged to “Make Do and Mend,” often remaking mens clothing into their own (since the men were away at war). As a result, suits became even more popular and women’s fashion absorbed the use of classic menswear fabric and patterns. Military styling also became fashionable during this era, with the use of epaulets and large bellows pockets, as witnessed with cropped “Eisenhower Jackets” that have made a resurgence in recent years. At Peruvian Connection, we love the edgy juxtaposition of military details on an elegant, “feminine” garment. YSL’s “smoking jacket”, circa 1966. 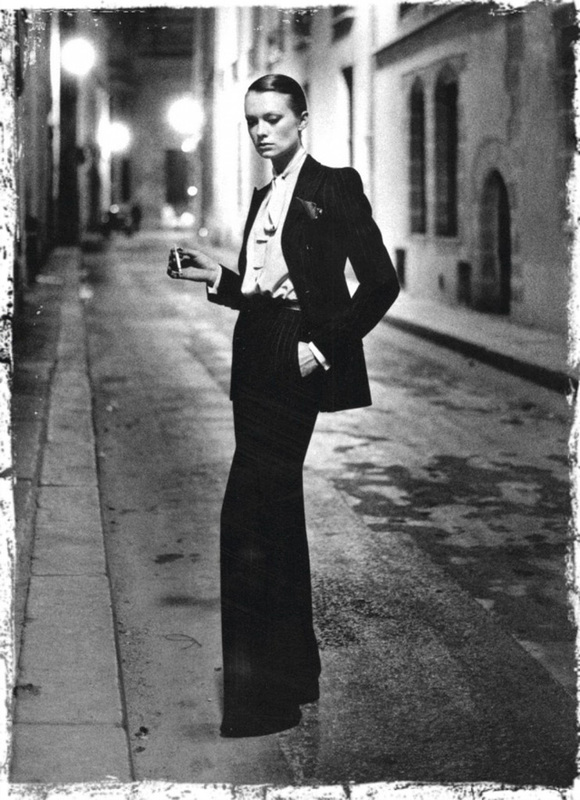 Yves Saint Laurent took menswear-inspired styling to new (sexier) heights with his “Smoking” Tuxedo Jacket. Created in 1966, his Tuxedo Jacket was hailed as the alternative to the Little Black Dress. As he said himself, “For women, the tuxedo is an indispensable outfit, which they feel comfortable with, so they can be who they are. This is style, not fashion. Fads come and go, style is forever.” To up the sensual, womanly appeal, he encouraged women to wear only their bra underneath–a trend that seems to be taking off in recent years! Undoubtedly, the Tuxedo continues to be an “indispensable outfit” for women, riddling runways, filling magazines and inspiring designers all across the world. Just check out our Kelston Blazer! Diane Keaton in “Annie Hall,” 1977. Image courtesy of IMDB. Although Coco Chanel, Marlene Dietrich and Katharine Hepburn rocked trousers before the 30’s, it really wasn’t until the 70’s that women commonly started wearing pants (meaning it was no longer rebellious!). In fact, it wasn’t until 1972 that the United States banned school dress codes that required girls to wear dresses! 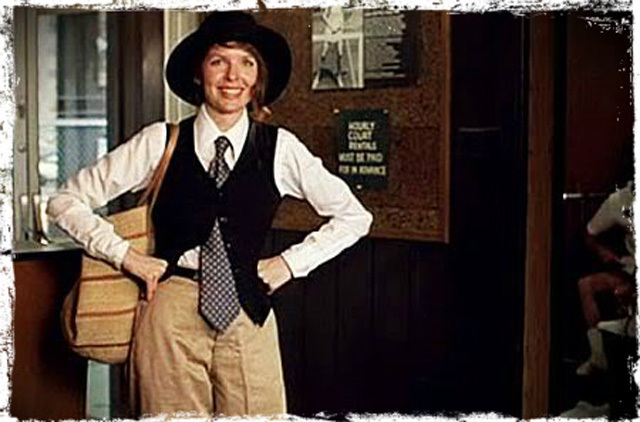 And then came “Annie Hall.” No one can deny the indelible print left by Diane Keaton’s menswear-clad character on the fashion world. With her cool, casual menswear styling, she helped popularize the Bowler Hat, vests, wide ties and button-up shirts on women—a look that is still popular to this day! 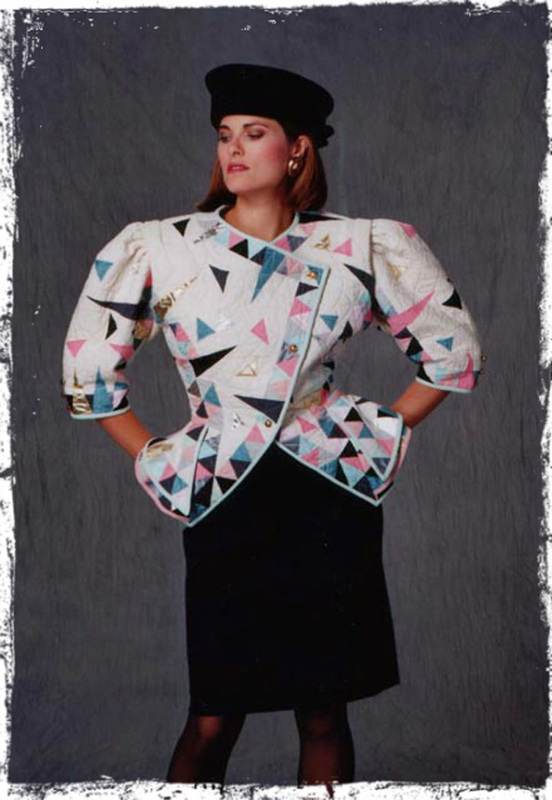 Another look that has yet to be forgotten: the iconic shoulder pads of the 80’s. They may seem laughable now, but, surprisingly enough, shoulder pads were associated with “power dressing”—a way for women in the workforce to show that they were equals to men. This time women’s fashion wasn’t borrowing from menswear per say, rather we were borrowing the look of their broad shoulders! Making menswear our own. Image courtesy of practicalenrichment.com. These days, “menswear” is everywhere in women’s fashion—from sculptural shoulders, buttoning vests, plaid patterns, classic fedoras and military trench coats to slouchy boyfriend jeans and suit sets. But, we’ve made it our own—cinching in waists, adding ribbons or lace, brightening colors and softening fabrics! Check out some of our favorite menswear-inspired pieces.